« Yay 50! Uhhh what now? 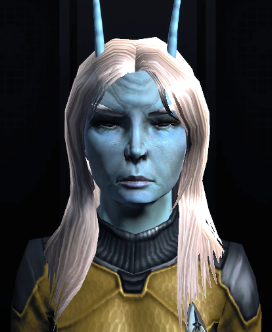 I have an Andorian Tactical alt named Khynalas Aveni, or Khyn for short, that I’ve been working on sporadically for months. He was in limbo for quite a while until I got motivated recently to get him up to Lieutenant, grade 6, and send him through the Cloaked Intentions featured episodes. He was pretty successful in his mission and had been promoted to grade 10 by the time he finished the mission Cutting the Cord. Along the way, Khyn received a transfer request from an Andorian engineering officer. I had a little chuckle when I looked at the request sent to Khyn. Poor Ensign Tytis. She look’s like the saddest Andorian in the quadrant. I may have to given her a makeover before I let her onto Khyn’s. She looks like she’d just be depressing to work around. Don’t you dare touch that face. So awesome! Yeah I was thinking after I posted that I’ll have to leave her as is. Now that’s really a sad face! Isn’t it? Most of the transfers are generic looking and I always change them, but this one was exceptional for blandness (if such a thing is possible). Surely they use something better than razors in the Federation. I have to go check with Memory-Alpha. Alternatively — she might be incredibly stoned. Oh my god! That could be it. Which is worse though, a stoned officer or a depressed one?